Persianfootball.com – DUBAI, The much anticipated Persian Gulf derby between Iran and Iraq only kept it’s promises in one aspect, in a heated and intense match, the two sides fought out a goalless draw. While Iraq changed their previous lineup on only two positions, Carlos Queiroz included four new players in the lineup, while benching a couple of key players. A risky approach by Queiroz, which certainly negatively influenced Iran’s performance, but eventually was rewarded with the needed result. Defensive boss Morteza Pouraliganji was rested and replaced by Majid Hosseini, who built the central defense with the even more inexperienced Hossein Kanaanizadegan. In-form Mehdi Taremi made space for recovered Alireza Jahanbakhsh, who obviously needed today’s appearance to regain shape after two months without football. Former Olympiacos left-back Ehsan Hajsafi and former Bundesliga and Premier League midfielder Ashkan Dejagah made space for Milad Mohammadi and Rouzbeh Cheshmi. 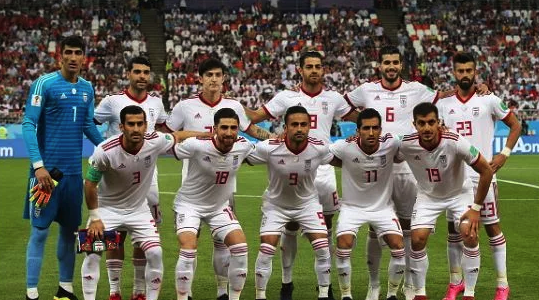 Especially the latter change had a huge impact, as Iran’s midfield now consisted of a very fighting and defensive oriented trio, leaving the attackers mostly without significant service. Nevertheless, Iran became the more dominant side of the first half and had two good chances. Sardar Azmoun should have buried a cross from the left side, but his close range header was slightly off target, early in the game. And towards the end of the second half it was Jahanbakhsh, who smashed a loose ball over the crossbar from inside the area. Iraq didn’t have any big scoring opportunity, but the newly formed Iranian backline allowed too much space to the wingers and couldn’t always prevent Mohannad Ali in center from getting his head to the ball in dangerous position. The most challenged man on the field though was referee Irmatov, who needed to be spot-on in a match with emotions flying high. He looked to be right on not awarding Iran a penalty despite and obvious but unintentional handplay inside the box, but simply didn’t spot a similar but much unforgiveable incident in second half. Iran on the other hand were lucky, when Saman Ghoddos, who this time appeared on the left wing, was only awarded a yellow card for stepping on an opponents leg. Second half started as open as the first, but slowly Iraq, who needed a win to top the group, got the upper hand by the hourmark. Iran sat back, defending comfortably and so Iraq remained mostly harmless. But they should get their matchball, when one cross found substitute striker Alaa Abbas in center, and his great header was denied by Alireza Beiranvand’s fantastic save, after 76 minutes. The goalless draw put an end to Iran’s record run of nine consecutive Asian Cup group stage wins, but added to another great statistic, as it was the eighth consecutive clean sheet in Asian Cup group stage matches – the last goal was conceded against no other than Iraq, in a 2-1 win for Iran on January 11, 2011. Group winners Iran will be now rewarded with what looks like an easier route to the semifinal on paper, most likely facing Oman, Lebanon or Palestine in the round of 16 on Sunday before taking on the winner of the clash China and Thailand on Thursday, should Carlos Queiroz’s men survive the first knockout round.